What the Big Deal About Unreached People Groups? and all tribes of the earth will wail on account of him. If you spend any time around the subject of missions, the term “unreached people group” will come up. Or it should. Even a cursory study of the Bible reveals that “panta ta enthe” (all nations, or people groups) are to be discipled, are to be preached to and will be represented around the throne, in fulfillment of the promise to Abraham in Genesis 12. Sometime in the last century, Christians came to the realization that probably not every people group would become 100% Christian. Probably not every people group would become even 50% Christian. In fact, most informed evangelical Christians today realize that in most of the world Christianity is and will remain a minority religion. The goal is not to make everyone a Christian, but to give every one a hearing of the Gospel. This concept has gained great currency since the 1982 Lausanne Committee in Chicago where experts came up with an estimate of what it would take to give everyone in a people group a hearing of the Gospel. For the sake of simplicity here, we will say that a population needs to be at least 2% evangelical before they have the ability to tell everyone the Gospel without outside help. (An evangelical is one who is saved and believes in telling others how to be saved.). Less than 2% evangelical makes a group “unreached.” Thus, our missionary effort needs to focus on unreached people groups. It is shocking to realize that 40% of the world’s 16,000 people groups are unreached. They are 42% of the world’s population. 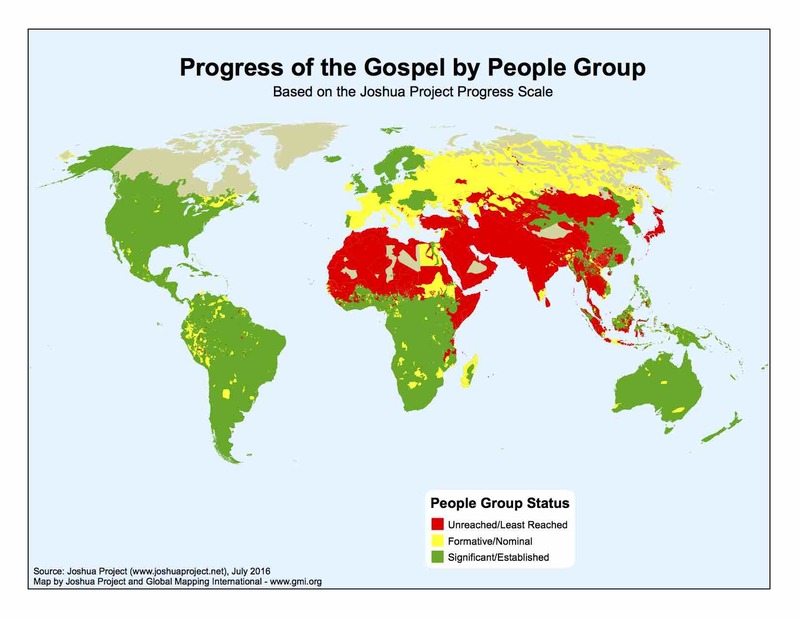 It is shocking because it means that those who are born in the unreached red zone of the map above have a 90% chance of never meeting someone who tells them of salvation in Jesus. It is shocking because there are 2.2 billion people who call themselves Christian and yet they are so ignorant or so callous about that 42% of humanity that it is not a big deal to them whether the unreached hear about Jesus or not. The other shocking fact is that we have had 2000 years to get the job done, but so far we are only 60% finished. Our missionary effort needs to focus on unreached people groups. It seems that Jesus is waiting for us to do so. In Matthew 24:14 he said, “And this gospel of the kingdom will be proclaimed throughout the whole world as a testimony to all nations, and then the end will come.” Doesn’t it behoove us to find the nations where people have never heard and go there? I find myself visiting joshuaproject.net all the time to assess the condition of various countries, races, and languages. It is truly an amazing tool available to anyone with an internet connection. It enables one to see every corner of the world with Gospel glasses. When you put on those Gospel glasses, Bangladesh stands out from the rest of the world as containing the largest and least reached large group. In the whole country 98% of the 160 million people know Bangla. Even when you dig down into the subgroups that exist in the country, you find that the largest single unreached tribe in the world, the Shaikh, live there at 136 million strong. 0.0% are Christian. In Revelation 1:7 it says that when the Lord Jesus returns to this earth “every eye will see him.” Shouldn’t every person hear of Him and have the chance to accept Him before that day comes? This is a real eye-opener and puts things in perspective. Let us press on with the work He has prepared for us.